Founded in 1969, in 2019 we are proud to be celebrating 50 years of helping our customers making unforgettable memories on the waterways of Europe and Canada. So whether you are new to boating, or have been exploring the waterways even longer than we have, check out a little bit about our past, discover some of the fantastic images we have gathered over the years and get in touch to share your own holiday memories! We have been boating along French waterways since the late 60’s, and our customers have been making unforgettable memories ever since. We are proud to have come a long way from humble beginnings. 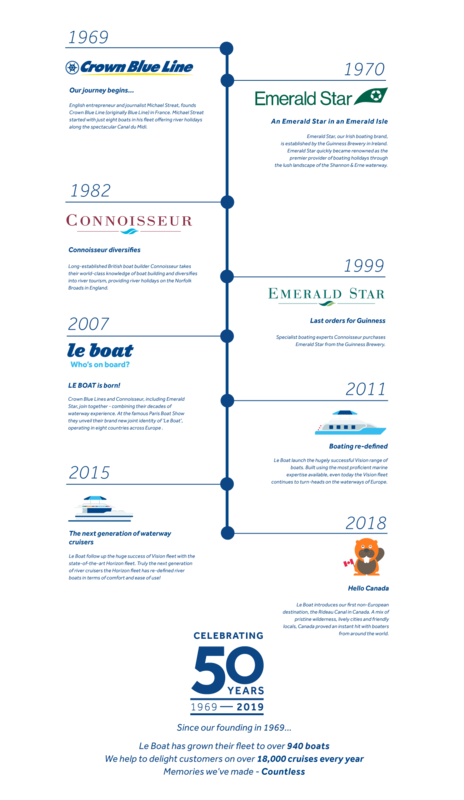 Our history can be traced back to the entrepreneur, Michael Streat, who founded ‘Blue Line’ with just eight boats on the Canal du Midi, France in 1969. So, keep your eyes peeled as we’ve got some exciting events lined up over the next few months to celebrate our big five-O! Or, get in touch and share your own memories of holidays with Le Boat. At Le Boat we never stand still. We innovate and always strive to provide the best holiday adventures. In recent year we have changed what traditional holiday cruisers look-like, releasing our state-of-the-art Vision and Horizon boats. These boats have re-defined comfort and ease-of-use, and offer the ultimate boating holiday experience. When we’re not challenging the way things have always been done, we are pushing boundaries. In 2018 this reached its pinnacle with the release of our first North-American destination – the Rideau Canal in Canada. We took our decades of waterways experience in Europe and applied it to a whole new continent! Launching to rave reviews our Canada destination, has opened up a well-kept local secret to a global audience. We can’t wait to see where we go next! If you have your own memories of holidays with Le Boat, Emerald Star, Crown Blue Line or Connoisseur that you would like to share, why not get in touch? Subscribe to our email newsletter to keep up-to-date with all our latest 50th anniversary events.